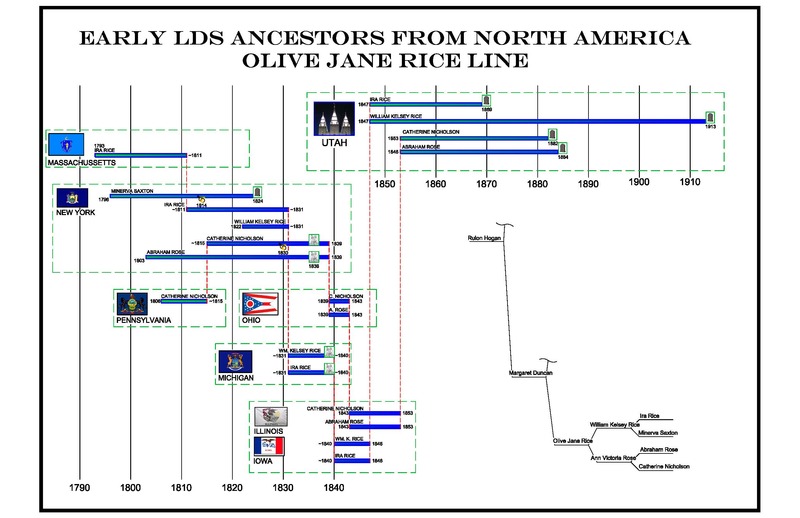 This timeline shows the important dates and places of our earliest LDS ancestors, who originated in North America - Olive Jane Rice Line. Abraham Rose Jr. was born October 5th, 1803 at Utica, OneIda County, New York; was baptized into the Church of Jesus Christ of Latter-day Saints In August, 1836, by Elder Orson Hyde. He soon after emigrated to Ohio, and next to Nauvoo where he arrive In October, 1843. He passed through the mobbing, persecution and expulsion of the Saints from that place, coming to Council Bluffs In 1847, and to Salt Lake in 1853. At age 80 years, 11 months, and 5 days on September 10, 1884 in Farmington, Utah he dIed as he had lived, a true and faithful Latter-day Saint, an affectionate husband, and a kind and loving father. !Farmer, Belonged to the 26th Quorum of Seventies, Record Book, p 90., Baptized by Orson Hyde, Ordained Elder Sep 1836 in Amity, Alleghany, New York; Seventy, Feb 1854 in Nauvoo, High Priest 8 Apr 1854 in Salt Lake City, Utah; Patriarch 5 Aug 1855 in Farmington, Davis, Utah. Came to Utah 17 Sep 1853, John W. Cooley Company. He was president of the High Priests Quorum for 30 years. "Latter-day Saint Biographical Encyclopedia." President of Lima Branch, LDS Church, Lima, Illinois (Land and Property Office Records, LDS Visitors Center, Nauvoo, Illinois. !SOURCES: Family history; Pioneers and Prominent Men of Utah; F Utah F2 pt 1 6284, Farmington Ward Records; TIB; SL Sealing Children to Parents GS#25261 pt 3 pg.479; EH Sealings #25165 pt 18 pg 340. [S6] International Genealogical Index, The Church of Jesus Christ of Latter-day Saints, Film 0471909, Page Reference (Reliability: 3). [S3] FamilySearch Extraction Program, The Church of Jesus Christ of Latter-day Saints, ((http://new.familysearch.org)), accessed 16 Dec 2016), entry for Abraham Rose, person ID KWJY-J2T. (Reliability: 3). [S6] International Genealogical Index, The Church of Jesus Christ of Latter-day Saints (Reliability: 3).